Infused with abundant essences, this sheet mask adheres very well, soaking every mm of your skin with active ingredients. 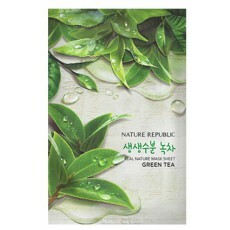 Formulated with green tea that deeply moisturizes skin and helps skin remain moisturized. Green tea is a powerful antioxidant, that also calms and soothes tired and dull skin. Treat your skin a home spa that only last 10-20 minutes with this sheet mask! After cleansing and your toner, open the package and apply the sheet mask over face. Let it sit for 10-20 minutes and remove. Pat in remaining essences. Leave as is and head to bed or follow with your moisturizer or sleeping mask. TIP: sheet mask work the greatest after scrubbing or exfoliating, since exfoliating unclogs pores, letting the essences absorbed deeply into your pores.